This post originally appeared on the blog Brain Waves Instruction. Dr. Carol Dweck researched thousands of students. Her discoveries about growth mindset have had a direct impact on so many classrooms! That’s because her work found that students with a growth mindset achieved more than those with a fixed mindset. Of course, teachers took action! Teaching lessons that help students develop a growth mindset became just as important as the other great lessons teachers teach… and that’s a good thing! 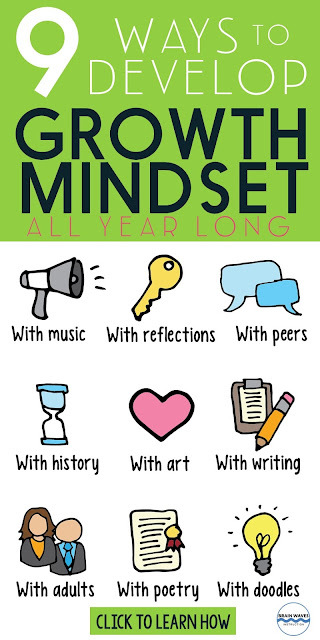 Like many lessons that help students develop as learners, growth mindset is one of those concepts that lends itself to teaching many times throughout the year. It’s not a “one and done” concept. That’s why I thought that it would be fun to compile a bunch of ways to help students develop a growth mindset all year long. 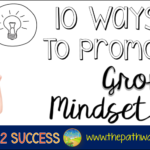 Let’s dive into those 9 ways to develop a growth mindset, shall we? — Pass out the lyrics of the songs. Then, have students select their favorite growth mindset line from the song. You might have students write the lyric on a post-it note. Then, they can discuss their favorite lines with the class or even stick them on their desks for daily inspiration. — Send students on a growth mindset song hunt. 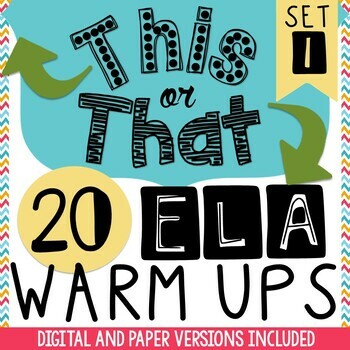 Challenge students to find songs that have a growth mindset theme. Or, have students find an artist that has demonstrated a growth mindset in his or her life. — Have the class pick a growth mindset theme song. Perhaps students could vote on songs that you’ve selected. Or students could bring in growth mindset song “contenders.” Then, the class could pick a growth mindset song to be the class’s theme song. You could play this song and discuss its meaning at different times throughout the year. ➤ Doodle Desk Cards – These FREE doodle desk cards combine growth mindset quotes with growth mindset words and expressions. 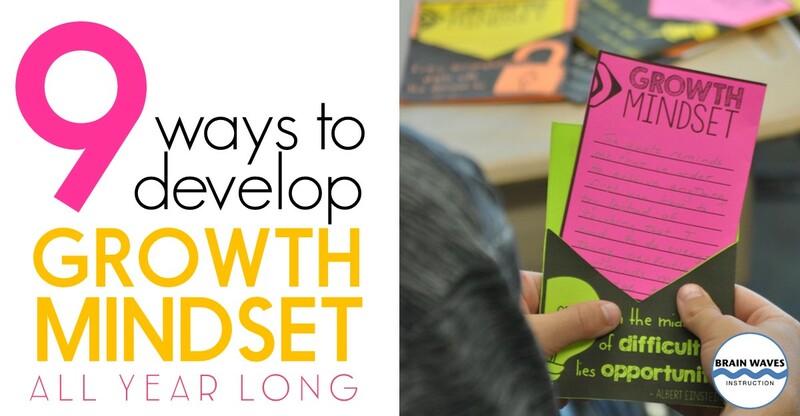 Students combine doodling with inspiration as they create desk cards that can sit right on their desks as a constant reminder of growth mindset. Download 4 FREE doodle desk cards and writing prompts HERE. 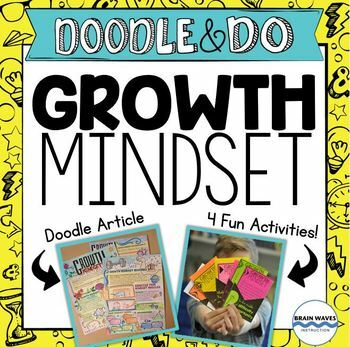 ➤ Doodle Growth Mindset Makeovers – When discussing the difference between growth mindset and fixed mindset, challenge students to doodle what they look and feel like with a fixed mindset. Then, have them give those mindsets a makeover with another doodle. 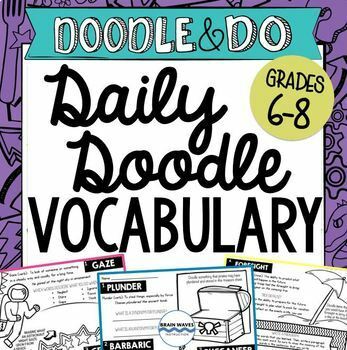 ➤ Doodle Article and Notes – I’ve also put together a super fun Doodle and Do resource that combines a doodle article and notes. Students doodle their way through learning about growth mindset before they complete 4 engaging activities (many from the ideas I’ll share below). It makes learning about growth mindset so fun and meaningful! After students learn about growth mindset, it’s fun to give them a chance to reflect on times when they have demonstrated a growth mindset. I love to use the analogy of a lock and key when discussing growth mindset. A locked lock represents a fixed mindset or a challenge. The key represents a growth mindset. When students have a growth mindset, they can unlock any challenge. You might use this same analogy in your classroom and pair it with a reflection. This analogy works great as the basis for a class discussion, but I’ve also turned it into a simple reflection activity. All you need is an open lock and key graphic. Have students write a challenge that they have faced inside the lock shape. Then, discuss how having a growth mindset can help students overcome the challenge. Task students to write about their growth mindset inside the key. I like to add string to the key and hang it around the lock shape. 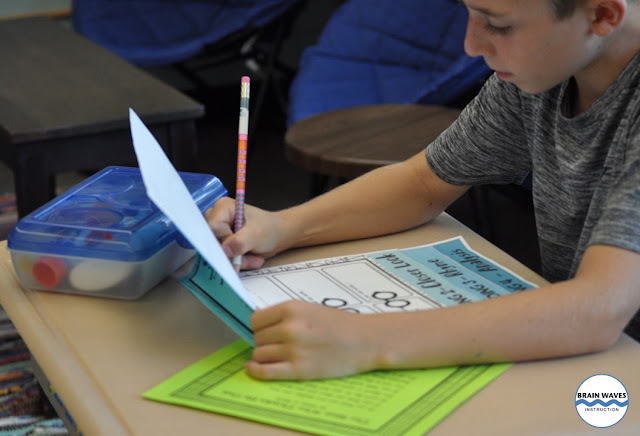 This reflection activity is great because students can connect growth mindset to their own lives! 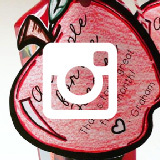 ➤ Have pairs of students or small groups write Growth Mindset Skits that they can perform for the class. Present the class with a fictional challenge. Then, have groups write one skit where the main character responds to the challenge with a fixed mindset. Have them write an additional skit where the character responds with a growth mindset. Encourage students to be over-dramatic when creating and performing the skit. 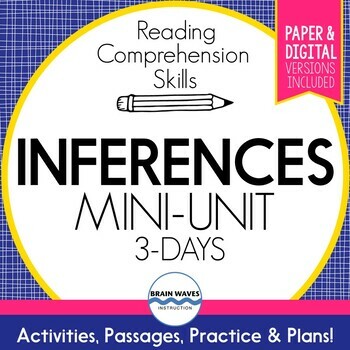 This makes for fun discussions, funny skits… and tons of learning! 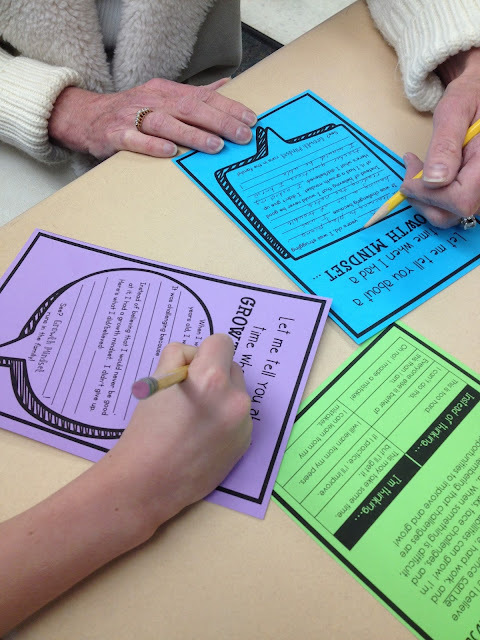 ➤ Give groups of students Growth Mindset Discussion Cards. These do not need to be fancy. You’ll just want a set of 5-7 cards with targeted questions for students to discuss about growth mindset. 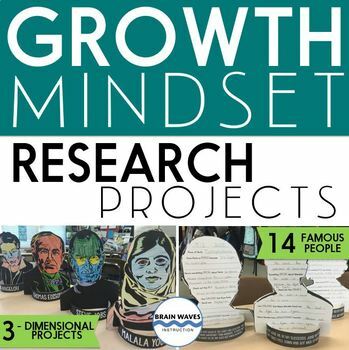 ➤ Combine research, writing, and growth mindset with Growth Mindset Research Projects. Have students research famous people and find evidence of their growth mindset. Take it a step further and have students make fun 3-D projects! 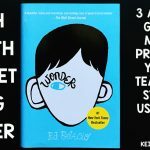 ➤ Set up a Growth Mindset Person of the Week. Each week you could discuss a famous person and his or her growth mindset. Some of my favorites are Malala Yousafzai, Dr. Martin Luther King Jr., and Albert Einstein. ➤ Read biographies about famous people who have a growth mindset as a read aloud to students. Take time to discuss how the person demonstrated a growth mindset in his or her lifetime. Instantly engage students as they learn about growth mindset with a fun art activity or project! ➤ Art with Jenny K. has an amazing resource where students create a huge collaboration poster displaying famous people with a growth mindset. This art project is fun to do any time of the year, but it also makes an incredible Open House display! ➤ Have students design coloring sheets with Growth Mindset Quotes. 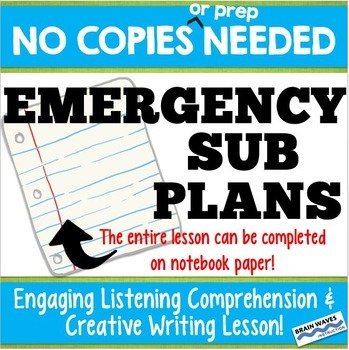 Then, you can create copies for the class. The entire class can work on each other’s sheets at the same time or you can set them aside as an activity for fast finishers. ➤ Challenge students to draw silhouettes or their faces (or provide generic templates). Then, have students fill the silhouettes with words and images from magazines that represent growth mindset. Providing students with lots of opportunities to write is an awesome way to help students develop a growth mindset. 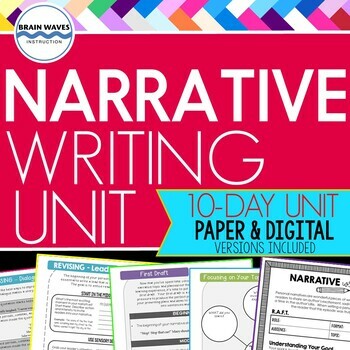 I’m particularly fond of using writing prompts to spark writing in the classroom. 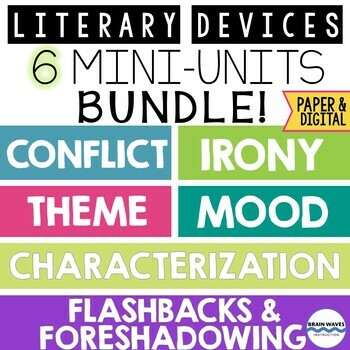 You might give students different prompts throughout the school year. They could even create a Growth Mindset Journal where they respond to the different prompts. Or, you could have them make fun Writing Prompt Pockets with growth mindset prompts. — Write about a time when you had a fixed mindset. What challenge were you facing? What thoughts were going through your head? How did the fixed mindset impact your success? — Imagine that you are visiting a classroom in a lower grade. When you arrive, you see a student struggling with his math work. He tells you that he’s terrible at math. He even crumples up his paper. What can you do to help him? How can you teach him about growth mindset? — Give one of your thoughts a “mindset makeover.” What is something you struggle with? What do you usually say to yourself about that task? Now, give those thoughts a makeover. What new thoughts could you think to help you have a growth mindset? ➤ Model growth mindset in the classroom. You’re one of the most influential people in your students’ lives, so be sure to use growth mindset statements throughout your day. Be open about your struggles and model how you can respond with a growth mindset. 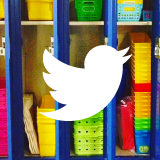 ➤ Get parents involved. Set up a collaborative writing prompt with students and their parents. This is especially fun at Open House, but you can do it at any time throughout the year. Just download this FREEBIE and get students and parents writing about growth mindset. ➤ Pair a poem with a couple of targeted questions for morning work. Then, discuss the poem and students’ responses. ➤ Give small groups a poem along with a few discussion questions. Students can read and analyze the poem together. Then, as an entire class, you could discuss its connection to growth mindset. ➤ Teach the critical skill of poetry analysis with a growth mindset poem. My favorite way to do this is with interactive flip books! ➤ Select a poem to read aloud to students. Reading poetry can even help students settle back into learning after lunch or a special. Check out my favorite poems to teach growth mindset here. 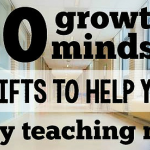 Well, there you have it: 9 ways to develop a growth mindset in your classroom all year long. 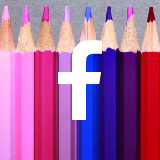 AND if you’re looking for even MORE ideas, be sure to pop over to Laura Candler’s blog. 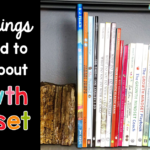 She’s teamed up with some awesome Teacher-Authors to share more growth mindset ideas! 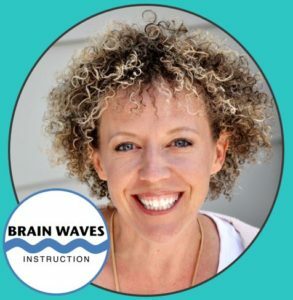 Mary Beth of Brain Waves Instruction has spent over 10 years enthusiastically teaching middle school English Language Arts. She’s also taught internationally in Belize, England, and Africa. She’s an active curriculum writer, occasional decorator, and sometimes-frazzled mother (to two fun and rowdy boys). She’s passionate about making teaching AND learning more fun! 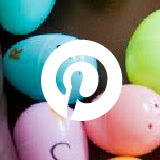 Find tips, tricks, and tons of ideas at her TpT store or follow her on Facebook, or her blog.